I had always been confused with this whole idea of religion and God, and how to approach Him. Its not that i am an atheist. I do believe in the good deeds or Karma. I also have supreme faith in the principle that whatever happens in life, happens for good. Heaven or hell, everything is here, in this life itself, and nothing after death. So, some of these principles are the guiding force for me towards God and His greatest gift to us – LIFE. Do i need to wander around in temples, mosques or in churches to reach Him? I need to search Him within. You name it, and I can find Him everywhere. Do i pray to God then? Yes, i do – while walking on the pavement, riding a train, eating my food, thinking of my loved ones, anything and everything i do. So, which are better ways to approach him – kneel before him, fold my hands, light a candle, or any of those ‘prescribed’ norms? I am sorry, i do not know about that. I just keep Him in my thoughts and in my actions towards my fellow beings. I am not a huge follower of rules though. Religion to me is a way of life, a philosophy, a message that each one of us are equal. Its not a holy book or a scripture to me, not even about rituals, and least about any dogmas laid down by the so-called ‘voices of Gods’. Let me just be a free bird, enjoy this life without any bonding or fear. Coming back to the photo above, I shot it on the trip to Bodh Gaya in Bihar – the place where Lord Buddha attained enlightenment, sitting under a tree. I too tried sitting under this tree for few minutes but the only enlightenment i achieved that day was, let me indulge in my passion – read, photography – and capture the images of those who are seeking enlightenment at that very moment. So, i set off in my mission, capturing the life around the temple. I saw this old Buddhist monk, deep in his prayers, siting in a far away corner of the temple premise. Watching him, i thought about the tranquility and purity of thought one experiences within our hearts, visiting such places. So, let me tell you about the rules for this challenge. Fairly simple: 1. Post a black & white photo everyday for consecutive 5 days, and 2. Invite someone to participate each day. So, what are you waiting for? You all are invited to be part of it. Find my Day 1 and Day 2 photos here. Since i need to invite someone specifically, let me today invite Sreejith from Santiago The Shepherd. I have always admired his photography skills, the way he composes his shots, the way he weaves the stories around them, the kind of diversity he brings about in his work. Absolute delight. You must visit his website. We always have conversation about our blogs and i get to learn a lot from his experiences and works. It would be super fun to watch his black & white shots for this challenge. Lets see what he has got up his sleeves from the enchanting land of Kerala – God’s Own Country. Have fun, enjoy your life and do good always! 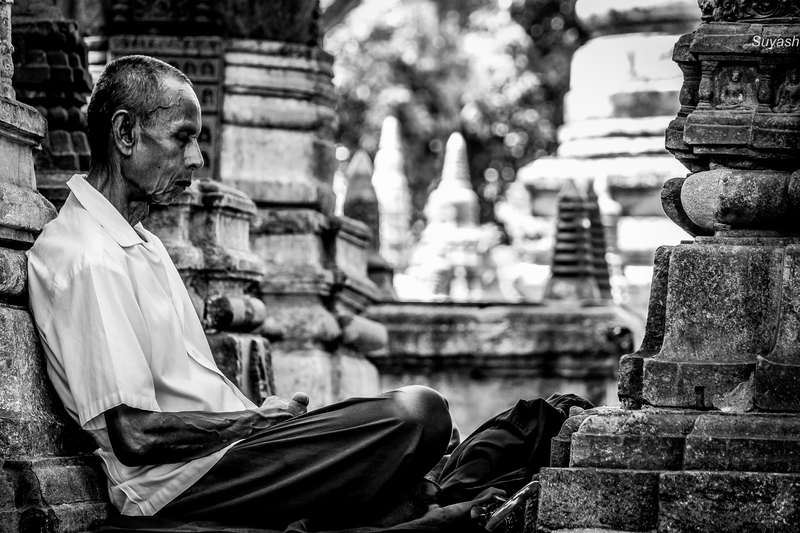 This entry was posted in Life, Photography and tagged Bihar, Black & White Photography, Bodh Gaya, Buddha, Enlightenment, God, India, Karma, Kerala, Life, Philosophy, Photography, Religion. Bookmark the permalink. This photo speaks a lot. Nice capture here! Also your thoughts about God are similar to mine. I too believe that religion is a way of life and you have described it very well. The first thing that comes to my mind about Kerala is backwaters. You on the other hand portrayed a new picture of Kerala which is “religion”, well captured. Good morning, Suyash. Wonderful photo… you describe the photo very well. Truly appreciate your thoughts on religions and I agree with your view. Thanks Susanti. When I was in Bali, I did capture some good shots. You will find them in Day 2 n Day 5, yet to be posted. But I especially liked this one, seeing the calmness on his face and the small place tucked in a corner where he was sitting – very appealing for a shot. Even I am waiting to see his shots. I am sure those will be gems, as usual. Excellent!! I will take a look later today 🙂 Have a great day! !